The Sunbeam Café is located at the confluence of the Main Salmon River and the Yankee Fork where history and magic come together. Come enjoy the best food in the Sawtooths! We source local, organic, seasonal, and sustainable ingredients and put it all together in a delicious way. We love food. We love preparing, cooking, and sharing our food and you’ll taste that in every bite. Come sit on our deck, play games on the grass, cozy up inside during a cool summer morning while soaking in the mouthwatering smells coming from our oven. However you spend time with us, you’ll be glad you did. Time slows down in Sunbeam and you’ll notice how good it feels to stop the rushing, hustling, and bustling. It feels good to savor long summer days, the company of friends and family, and absolutely delicious food. We look forward to seeing you in Sunbeam, Idaho! Open: June 23rd through August 21st, Thursdays through Sundays, 8am to 8pm. Rafters! 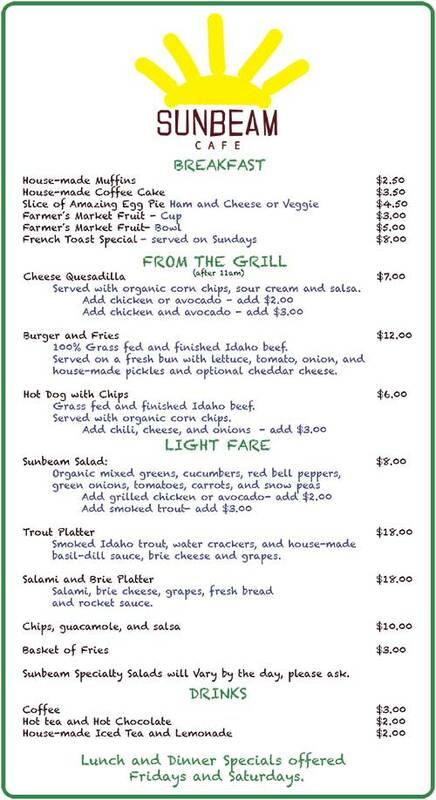 There is no better way to start or finish your raft trip with White Otter than with a meal at the Sunbeam Café. We wanted our river guests to be able to enjoy the best food around, with a selection to satisfy everyone, and the time and space to enjoy and savor every bite. We take great pride in the food we make, the way we prepare it and the recipes we have selected to share with you and your family. We use organic and locally grown produce, organic ingredients in our baked goods, and Idaho grass fed and finished meat products whenever possible to insure the best quality. We hope you’ll taste the love in every bite. The Sunbeam Café is a product of generations of food loving boys and girls who wanted to share their enthusiasm for a great meal with the amazing and wonderful people who pass through this magical place. Starr Weekes (Moo Moo to many), the matriarch of our clan, was raised in the South where coveted family recipes were her trump card. She has spent her lifetime perfecting those recipes and sharing them with her communities- in Ketchum since 1973, with White Otter guests since 1983, and in Sunbeam since 2014. In that time she has shared with her daughters Liza and Nancy her heavy hand with butter, her delicate touch with herbs and spices and her gift for making people want more. Now Starr, Nancy, and Liza have made sure that everything we serve you is what we would serve our family and friends- the very best recipes with the highest quality ingredients and made with love. Our menu is short and simple and our hours are not as long as the summer sun dictates, but for now the three of us prefer to prepare, serve and perfect our recipes with the help of the next generation- Sam, Lila and Benjamin and the other members of our extended Sunbeam family. The tradition continues and we are so happy you stopped in to be a part of it. Leave something on our memory wall and think of us throughout the year as we will you. Enjoy!